This is a kit bash of a Baby Bertha that transforms a mild mannered rocket into mean, green, flying machine--the BioHazard. One challenge was the tight fit of three 18mm motor mount tubes inside the BT-60 body tube. 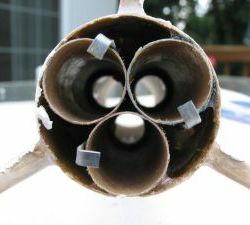 The 3 tubes were glued together and the inside "hole" was filled with a dollop of epoxy with a little paper wad as a backer. The 3 motor tube assembly fit inside the BT-60 with all the tubes making contact for a perfect fit. I made a custom "centering ring" consisting of 3 separate wedges to basically fill in the triangular spaces between the outside of the 3 motor tubes and the main body tube. The whole assembly was glued in placed. I could have used the same wadding and glue fill that I used in the center but wanted something was less messy and a little lighter. I used Bondo to smooth out the body tube to wooden dowel transition as well as the dowel to fin transition. Finishing was accomplished by paper laminating the fins to fill in the grain (paper applied before assembly) and lots of fill and sand. After a few coats of gray primer, I painted the whole rocket with 3 coats of bright red. The main body tube was finished using artwork printed on a full sheet of high resolution adhesive backed ink jet paper. 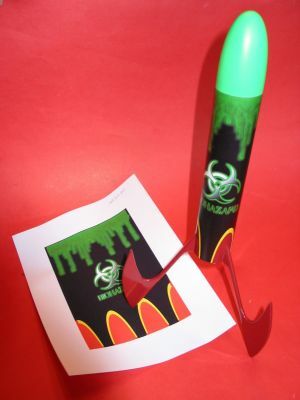 I downloaded the biohazard symbol and "dripping goo" art from the web and composed the wrap in PaintShop Pro. I calculated the required size for the wrap and printed some test sheets to make sure the beginning and ends of the "decal" lined up. After printing the label, I fixed the ink with clear sealer and let it dry. For added water resistance, I mixed up some epoxy and "trowelled" it onto the paper and then wiped it back off. This made the paper almost like vinyl and deepened the colors. After cutting out the sections around the fin dowels that I wanted to remain red, I carefully applied the wrap to the body tube. I then airbrushed the nose cone a bright florescent green and epoxied on the launch lugs. I started with a basic Bertha BT-60 body tube and nose cone but wanted something that looked threatening for the lower section of the rocket. I also wanted something fast so I went with a 3 cluster 18mm motor configuration. I used RockSim to design a 3 sickle fin design to mimic parts of the international symbol for a biohazard. I tweaked the fins shape and standoff dimensions for proper stability, printed out the patterns, and cut them out of 1/8" balsa stock. 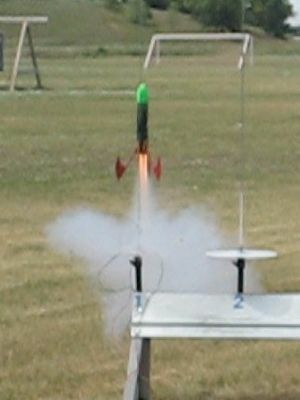 The fins are mounted below and away from the rocket body on wooden dowels that go though the body tube and extend to the motor mount tubes. Generous amounts of epoxy are used to mount the fins to the dowels and the dowels to the body tube. 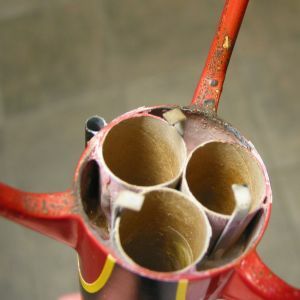 I decided to use a Kevlar® shock cord epoxied to the inside of the body tube which in turn is attached to a standard elastic cord to soften the ejection shock. I used double 1/8" launch lugs to distribute the friction and torque. The use of paper lamination provides limitless possibilities for finishing the rocket. The tricky part is in the preparation of the artwork and the application of the paper to the tube or fin. One the paper makes contact, it is difficult to remove without tearing or fouling the substrate. You also have to experiment with different sealers to ensure you don't use something that makes the paper translucent like wax paper. I found the cheap Wal-Mart brand clear sealer works best. I also make sure that I paint the surface white first if I have a wrap or lamination that has white or light colors. This keeps blemishes from being visible under the paper. I flew this rocket on a 3 motor cluster of A8-3s. Wow. It took off! The rocket deployed nose cone up at apogee with all three motors ejecting about the same time. I packed the rocket full of cellulose wadding so the 12" plastic chute survived the ejection charge and brought the rocket down at a good but not fast pace. 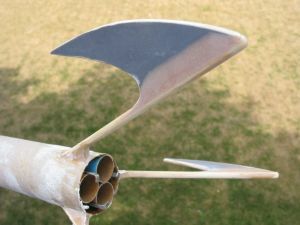 The use of copious amounts of epoxy make the fins strong (as does the paper lamination) so there was no damage even after landing on hard dry ground. The use of paper lamination for finishing allowed me to create an kit bash with an artistic theme--matching the sickle shaped fins to the black and green finish scheme complete with oozing goo and biohazard symbol. I now try to design all of my smaller rockets to exploit the paper lamination finishing technique.